On February 1, FERC released its most recent update covering calendar years 2015 and 2016. The report shows that combined newly installed capacity from renewables – biomass, geothermal, hydropower, solar and wind – totaled 16,124 megawatts (MW), or 61.5 percent, surpassing that from fossil fuels and nuclear power combined. Last year the newly installed capacity from natural gas was 8,689 MW; from nuclear power, 1,270 MW; oil, 58 MW; and coal, 45 MW. In 2015, renewable sources added 12,400 MW of new generating capacity, or 64.8 percent of the total installed during that year. Almost half of all new U.S. capacity, 49.6 percent, came from renewables in 2014. During calendar year 2016, new wind generating capacity grew by 7,865 MW and was nearly matched by new solar generating capacity, 7,748 MW. There was also 314 MW of new hydropower capacity and 197 MW of new biomass capacity. No new geothermal steam generating capacity was added last year. Wind power has blown into first place as America’s largest renewable resource, says Michael Goggin of the American Wind Energy Association, an industry group. 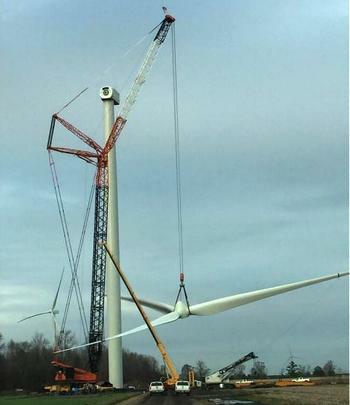 “American wind power just passed a historic milestone – it’s now the country’s largest renewable resource by installed generating capacity,” Goggin blogged on Thursday. “U.S. wind capacity now stands at over 82,000 megawatts, surpassing the 80,000 MW at the nation’s hydropower dams,” he wrote. Wind energy is now the country’s fourth-largest source of electric capacity, behind natural gas, coal and nuclear energy but ahead of hydroelectric and solar. Wind generates about 5.5 percent of America’s electricity, enough to power 24 million homes, and about five times more than solar, Goggin writes. Both Iowa and Kansas produce over 30 percent of their electricity using wind, while Oklahoma and North and South Dakota all generate over 20 percent with wind power. Ken Bossong, executive director of the nonprofit Sun Day Campaign, which advocates a sustainable energy future, warns that the Trump administration is making a mistake by concentrating solely on fossil fuel development. Bossong points out that generating capacity is not the same as actual power generation. Electrical production per megawatt of available capacity, called the capacity factor, for renewables is often lower than that for fossil fuels and nuclear power, he explains. The total installed operating generating capacity provided by renewables in 2016 is now 19.17 percent of the nation’s total, while actual electrical generation from renewables in 2016 is roughly 15.2 percent, according to the latest U.S. Energy Information Administration, EIA, figures. Bossong says both of these figures understate renewables’ actual contribution because neither EIA nor FERC fully accounts for all electricity generated by smaller-scale, distributed renewable energy sources such as rooftop solar. Even so, the rapid growth of renewables, particularly solar and wind, has captured an ever-growing share of the nation’s total generating capacity. Each of the non-hydro renewables has grown during the past five years and their combined capacity, 10.67 percent, is now greater than that of nuclear power at nine percent, and nearly three times that of oil at 3.79 percent. Coal generates 24.65 percent of the nation’s power. By comparison, the shares of U.S. energy capacity provided by oil, nuclear power, and coal have all declined over the past five years. Only natural gas has experienced growth – from 41.60 percent in 2011 to 43.23 percent today. 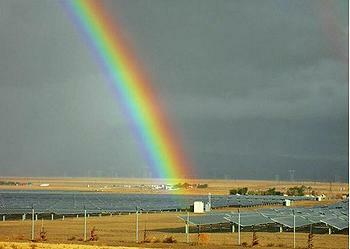 Solar has enjoyed the greatest percentage increase of any U.S. energy source. Solar power’s share of the nation’s generating capacity, 2.0 percent, is now nearly 12 times greater than it was five years ago in December 2011 when it was just 0.17 percent. And, the growth in solar capacity is accelerating. New solar capacity in 2016 more than doubled that added in 2015 and now exceeds that of biomass and geothermal combined. The growth in solar generating capacity is generating job growth, says the Solar Energy Industry Association, SEIA. Experiencing its biggest growth year yet in 2016, the U.S. solar industry now employs more than 260,000 Americans, according to The Solar Foundation’s seventh annual National Solar Jobs Census released February 7. With 51,000 jobs added to the U.S. workforce by the solar industry in 2016, this marks the fourth consecutive year of more than 20 percent growth year-over-year for solar, which greatly outpaces job growth nationwide. 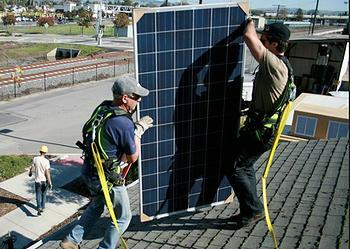 Across America, the number of solar jobs have nearly tripled since 2010.